Whilst the hype around mobile health has slowed down, the market for digital health still attracts new entrants, reveals the largest global study on mHealth App Developer Economics 2017. 26,000 mHealth publishers have entered the market since 2016, totaling 84,000. Furthermore, 78,000 new health apps have been added to major app stores. The digital health market continues to grow attracting new entrants. 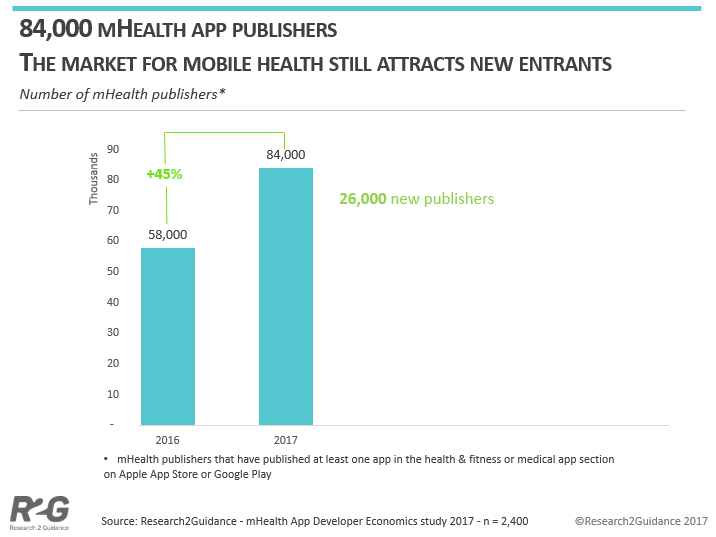 Currently, more than 84,000 health app publishers have released mobile apps for the medical and health & fitness market, 45% more since the beginning of 2016. The growing number of app publishers fuels the number of apps developed. Since 2016, 78,000 new health apps have been added to major app stores, showing a strong growth of 25%. In 2017, 325,000 health apps have been available on all major app stores – the most there has ever been. Who forms the global mHealth community? In 2017 the types of mHealth publishers have increased in diversity. 28% of the global mHealth market is occupied by purely digital market players, bringing mostly “digital-only” business models to the table. 23% of the digital health market is represented by non-healthcare companies: IT/Tech companies, consulting/research companies and app developers/agencies. Universities, NGOs and educational organizations represent a minor fragment of the digital health market, having a 10% share altogether. Telco companies used to be big at the beginning of mobile health. In 2017 they have shrunk to a mere 1%. Traditional healthcare stakeholders (industry incumbents: medical device and pharma companies, health insurers, hospitals, telehealth services) hold 32% of the market. These market players use mHealth solutions mainly as a digital extension of their core businesses. 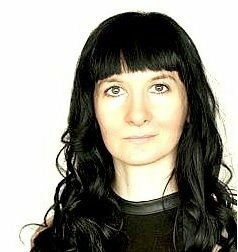 What makes newcomers different from other market players? The 5 key health segments newcomers’ app portfolio provide services for are: “connection to doctor” 25%, “heart and blood circulation” (20%), “staying healthy and fitness” (19%), “diabetes” (18%) and “mental health” (17%). In general, HCP integration plays only a minor role within the average mHealth app publisher’s portfolio. Newcomers tend to come mostly from Europe (46%) and the APAC region (17%), compared to the rest of the market. Especially Asian publishers have recently entered the mHealth app market. Newcomers also tend to have a different company background than the established players. The global share of new purely digital players is significantly larger than in the rest of the digital health market (40% vs. 28%). Digital intruders tend to be European, rather than North American. Newcomers have less external budget and spend much more of that money on external marketing. 46% of newcomers had less than 25,000 USD external budget. Only 4% had an external budget of up to 300,000 USD for outsourcing to a 3rd party. This is significantly larger than what the average mHealth company had to spend on their product development. In addition, newcomers tend to allocate more of their limited external budget on marketing compared to their established competitors. One fifth have spent up to 30% of their external budget on marketing. The three most popular marketing channels that work best for new publishers to increase their app awareness and get app downloads are: social media (49%), partnering with health associations (44%) and presenting the app on a conference (24%). The main revenue sources for newcomers come from: licensing their products (30%) and sponsorship (20%), all purely B2B revenue services. Whereas the rest of the market share focus more on B2C business models. Newcomers react on market dynamics. Their business models and niche know – how, for example in technology or retail, could transform mHealth app market and close the gap between users’ expectations/needs and different app markets potential. The mHealth App Developer Economics 2017 reveals detailed insights into the mHealth app market segments. If you are interested to find out more about the market players behind the mHealth app market, please reach out. The report also focuses on current market trends and future market developments.